Watching the sugar in your diet can help you control your weight and potentially avoid serious chronic health problems — for example, heart disease and diabetes. You might be surprised at how many of the "healthy" foods you eat contain sugar. Energy bars, fruit, flavored yogurt — all are "good" foods, but many of them have a lot of sugar. So, the first step to reducing excess sugar in your diet is to read labels carefully and opt for products that are lower in sugar. The American Heart Association recommends keeping calories from added sugars under 100 calories a day (24 grams, or 6 teaspoons) for women and under 150 calories a day (36 grams, or 9 teaspoons) for men. Make your own. Start with plain sparkling water or tap water. Add a flavoring that strikes your fancy. For example, you could try an ounce or two of 100% fruit juice; a slice of lemon, lime, orange, or grapefruit; a sprig of fresh mint; a few raspberries. No-frills coffee and tea. A small dash of sugar (or artificial sweetener) and a splash of milk is okay, but go easy on the extras like flavored syrups and whipped cream. Be aware that many popular coffee drinks are full of sugar — and calories. Transition to "diet" beverages. 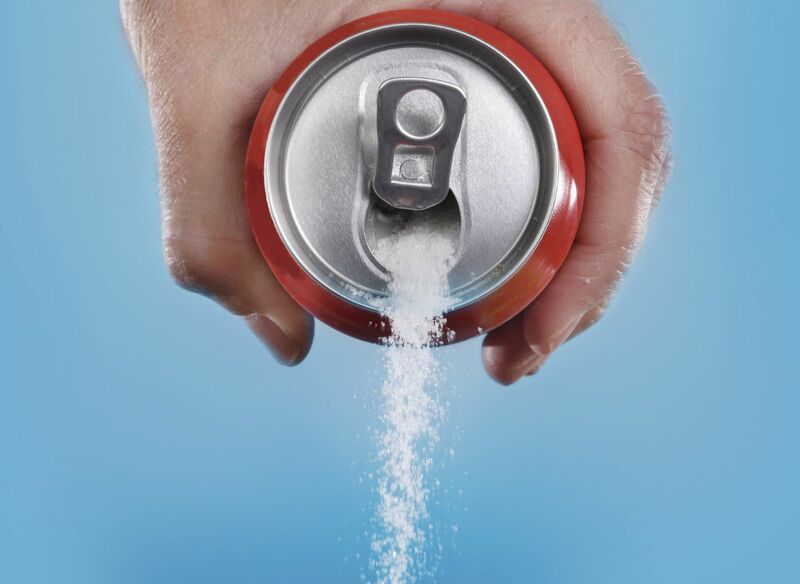 Sugar-free sodas and other soft drinks can help you transition away from sugar-sweetened beverages. But they won't help you give up soft drinks altogether and won't necessarily help you lose weight. Artificial sweeteners — for example, acesulfame, aspartame, saccharin, sucralose — give you the sweetness of sugar with virtually none of the calories. Most people who use artificial sweeteners or choose foods or beverages made with them do so because they want to lose weight. And for a lot of people, they do help. But some research suggests that the use of artificial sweeteners may actually promote weight gain. Artificial sweeteners are hundreds to thousands of times sweeter than table sugar. People who use these sweeteners often may desensitize themselves to sweetness. If that happens, they may find healthful but not-so-sweet foods such as fruits and vegetables unappetizing by comparison. Calories removed from the diet by swapping sugar for sweeteners may re-enter in the form of refined carbohydrates (like those found in crackers, chips, pastries, and the like) and unhealthy saturated and trans fats. If artificial sweeteners are helping you lose weight or keep it off, great. If they don't seem to be helping, or if you don't need to lose weight, you may be better off simply trying to cut back on the added sugar in your diet. For more ways to cut down on your sugar and salt intake, buy Reducing Sugar and Salt, a Special Health Report from Harvard Medical School.